The Grand Junction Rockies are the Rookie League affiliate of the Colorado Rockies and are members of the Pioneer League; which consists of eight teams in Montana, Colorado, Utah and Idaho. GJR are committed to the philosphies of affordable family entertainment with a strong emphasis in customer service and positive community involvement. Joe joined the Rockies front office in December 2015. Joe began his career as an intern with the Atlanta Hawks in 2011. He also spent time as a Ticket Sales Representative with the Hawks for before leaving to join the Oklahoma City RedHawks in 2012. While with the RedHawks, Joe started out as a Group Sales Coordinator and moved on to a Corporate Marketing Manager role. After leaving Oklahoma City in 2013 and before coming to Grand Junction, Joe spent time with the Quad Cities River Bandits as Director of Group Sales and Director of Sales and Ticketing. Joe is a native of Forreston, Ill., and a graduate of Northern Illinois University with a B.A. in Art in 2009 and a M.S. in Sports Management in 2011. Mick joined the Rockies front office in April 2014. Mick began his career as an intern with Saint Louis University Billikens Hockey team. He also spent time in the hotel industry working for Starwood Hotels in a hospitality management role. Leaving Saint Louis, moving to Grand Junction to pursue a career in sports. 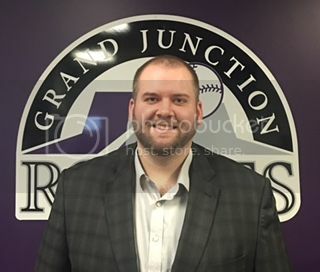 Mick started started with the Rockies as the Assistant Food and Beverage Director, after one year was promoted to Food and Beverage Director and also overseen aspects of the Rockies Group and Corporate sales. Mick now is the Assistant GM, where he will maintain previous roles while overseeing merchandise, internships and promotions. Mick is a native of Grand Junction, CO., a graduate of Fontbonne University in Saint Louis with a B.S. in Sports Management in 2012. Matt joined the Rockies front office in October 2016. 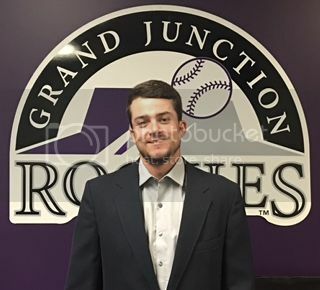 Matt began his career as an intern with the Grand Junction Rockies during the 2016 season. Prior to this he was a student athlete at Colorado Mesa University where he played baseball. His senior year he was the RMAC Academic Player of the Year. After graduating and completion of his internship he acquired the position of Concessions & Group Sales Manager. 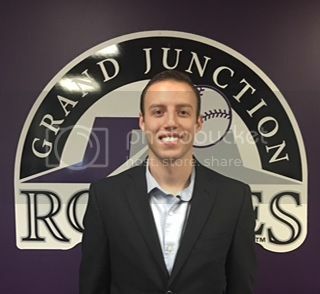 Jarah joined the Rockies front office in November 2016. Jarah began her career as a media relations intern for the Frisco RoughRiders in 2012. She spent the next few seasons interning with the Idaho Falls Chukars, the Quad Cities River Bandits, and the Pulaski Yankees. Jarah is a native of Tyler, Texas, and a graduate of the University of North Texas with a B.A. in Journalism in 2013.